You’re an idiot. My dog food says so. Most of us world-weary media-saturated types would probably consider ourselves above being manipulated by ads. We know they’re lying, and we know they think we’re idiots, and actually we’re much better than all that. You’re wrong. We’re idiots. Consider the world of dog food. Not something that is especially cut-throat (unless you’re one of the target animals, which is what? Uh… rats, the wobbly bits under a chicken’s beak, and cow lips?). Nevertheless, they work hard at making you believe all sorts of nonsense without you realising it. 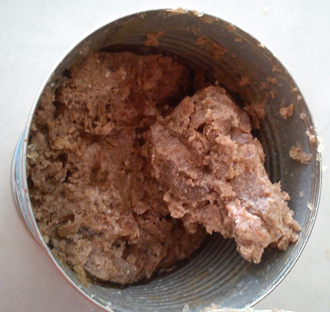 For example, have you noticed that it’s a long time since they last called it ‘dog food’? 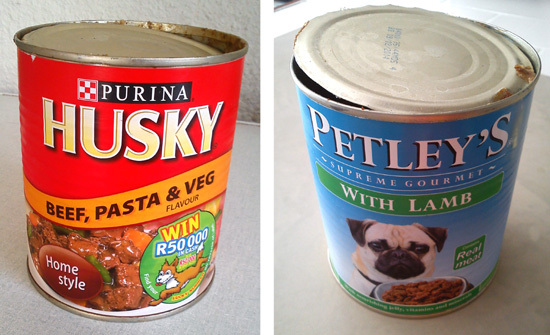 You’ll notice on the above tins that nowhere does it say, ‘Dog food’. You’ll struggle to find one that does. That’s because you wouldn’t like to be fed indiscriminate ‘people food’, so why would you treat your pet that way? (Hint: pets can’t read). But of course it gets worse. Look at that tin of Husky. It is ‘Beef, Pasta, and Veg Flavour’; oh and it’s ‘Home Style‘. What they’re trying to conjour up is an image of a hearty, balanced meal around grandmamma’s dinner table, home cooked and healthsome; sharing a hot cuppa something with family; good times with good food. Those however are people pictures. Your dog doesn’t have a grandmamma that he visits, he doesn’t eat steak and veggies with the kids, and he regularly — given half a chance — would eat human faeces and unidentifiable grey slime out of the gutter (true stories from real dog walkies). You can hear the dying screams of Keith Floyd as you open every can. It is exactly the same garbage they’ve been scraping off of the floor of the abattoir for decades. Your dog still prefers it to eating faeces 7 out of 10 times, as he always has. All that effort on the tin wrapper exists to make you think that you’re giving Bozo the best. But here’s the kicker. Even knowing all of this — even if they took two cans from the same conveyor belt — if they stuck that Husky label on the one, and a plain label that says ‘Dog Food’ on the other, you’d still buy the Husky one every time, even, I’ll bet, for a few bucks more. Heck, I would.